WASHINGTON (June 9, 2014) – “Date with Destiny,” a new book from first-time novelist Butterfly Brown and publisher AuthorHouse, was released this week and is available in bookstores, from Amazon, and Barnes & Noble. The book tells the fateful story of Destiny Hodgkin, the daughter of a high-powered New York real estate mogul and heir to his multimillion-dollar fortune. Destiny has everything: a successful career, handsome husband, luxury cars, and a shoe collection any woman would envy. Despite these luxuries, she spends most of her days longing for more – more excitement, intrigue, and passion. A hapless event puts Destiny’s life on an unexpected path when she mysteriously wakes in a hospital thousands of miles from home. Her life is turned upside down and an adventure begins as she finds her way home and uncovers the treachery of friends and family that changes her forever. The alias Butterfly Brown was inspired by the author’s close friend, Zoelin Brown, who passed away in 2013 from cancer. The book is dedicated to Zoelin and ten percent of the sales proceeds will be donated to support research to find a cure. The paperback edition of “Date with Destiny” can be purchased from Amazon for $15.50, from Barnes & Noble for $16.28, and from the AuthorHouse Bookstore for $16.95. The Kindle edition can be downloaded for $5.99. Review copies are available upon request from the AuthorHouse Promotional Services Department (1-888-728-8467). All interview requests for Butterfly Brown should be submitted to Arron Neal at 213-568-3334 or arron@arprla.com. Butterfly Brown is a journalist, poet and writer of short stories. Her most recent work can be found in the urban Maryland-based magazine Hot Spots, for which she serves as a contributing editor and columnist. 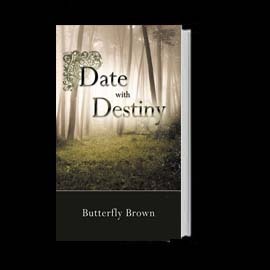 To learn more about Butterfly Brown and “Date with Destiny,” visit http://butterflybrown.com. Follow Butterfly Brown on Twitter @1ButterflyBrown. AuthorHouse is the leading provider of self-publishing and marketing services for authors around the globe. Committed to providing the highest level of customer service in publishing, AuthorHouse assigns each author a personal publishing consultant, who provides guidance throughout the process. AuthorHouse provides a broad array of tools and services to allow authors to make their own choices throughout the publishing process. Headquartered in Bloomington, Ind., AuthorHouse has released over 60,000 titles.